1  But Jesus went to the Mount of Olives. 2 At dawn he appeared again in the temple courts, where all the people gathered round him, and he sat down to teach them. 3 The teachers of the law and the Pharisees brought in a woman caught in adultery. 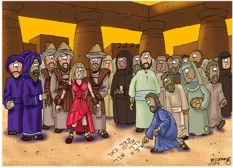 They made her stand before the group 4 and said to Jesus, “Teacher, this woman was caught in the act of adultery. 5 In the Law Moses commanded us to stone such women. Now what do you say?” 6 They were using this question as a trap, in order to have a basis for accusing him. 11 “No-one, sir,” she said. I decided upon a yellow sky to represent early morning, but didn’t put long, dark shadows in, as i felt that would detract from the drama of the scene. Jesus, writing i the dirt, the woman acused of adultery, held by 2 burly temple guards. A Pharisee pointing at her, with other Pharisees & temple guards behind him. Various people reacting to Jesus’ writing… a woman (in dark clothes) with a stone in her hand, obviously outraged at this woman’s sin, various people looking progressively more disturbed by Jesus’ writing. man & woman on extreme right who are walking away, looking sad, downcast, aware of their sin, etc. I decided that the temple could be large stone columns & spanning stones, but without a roof. There are a few buldings represented outside the temple’s columns.